Head to the boxing arena at the turn of the century, and don’t stop spinning until the bell rings. 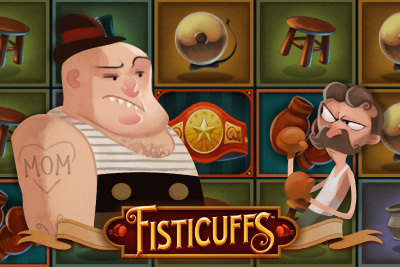 We love the look and sounds of this Fisticuffs slot game. The iconic ring of the bell when you win, the cheering crowd when the boxers appear on the screen. The slightly faded tones, yet brilliantly retro graphics. Even the name sounds wonderfully old fashioned in a way that makes us want to bring the word ‘fisticuffs’ back into the day to day of the English language. Unfortunately, whilst it looks and sounds fantastic, the game play is not up to par with other NetEnt slots. The boxing ring wild, when the boxers appear, is fun, but, in our opinion, not quite entertaining enough to grab you for the long haul. Fisticuffs mobile slot is all about the wilds. That’s the main bonus feature here. From straight wilds, to diagonal wilds, to stacked wilds, each arrive via the boxing wild feature when the two boxers find themselves next to each other. You then get one free re-spin with the wilds staying sticky on the screens for potential bigger wins. Simple, and for the first 50 spins, fun enough. Very much in the same vein as the Stickers slot, but without the hectic re-spin after re-spin. Other than that, this is an uncomplicated mobile video slot with a decent 96.7% rate and a fairly good 100,000 coins jackpot. However, as this is a fairly low variance slot, the chances of winning big here are not huge. This wouldn’t be a problem if there was more than wilds keeping us company on the five reels, but as with the old style boxing theme, once the nostalgia wears off, so does the excitement. But if you love a simple slot with the occasional knockout wilds, then there are far worse mobile slot games out there, at least with Fisticuffs you get the hope of a good in-game win and decent return rate. However if you expect constant crazy action, as per other NetEnt slots, then you should keep to Starburst or Jackhammer 2. Boxing Feature: When the little skinny boxer is diagonal to the fat boxer, or the fat boxer next to the skinny boxer on the reels, it starts a boxing match. One or other the punches the other one out, turning any symbols in their way into wilds. This leads usually to 3 or more wild symbols appearing on the screen. At this point you'll get one free spin to get bigger wins. Wilds and Stacked Wilds: The 'Wild' symbols substitutes for all symbols. During the Boxing Feature, stacked wilds can appear on reel 1 and 5 during a re-spin. A slow moving slot, Fisticuffs Touch is a mobile slot for those who love wild features and a simple spin. We felt it lacks true excitement for those of us use to the higher calibre of Net Entertainment mobile slots and the wins were not constant or big enough to truly entertain. Plus we really felt the loss of not having any free spins to hope for. However with a decent jackpot, a high return to player rate, and a great betting range (from 0.20 to 200 in cash) those of you unfamiliar or not fans of NetEnt may take a spin and like it, just for the sheer simplicity.